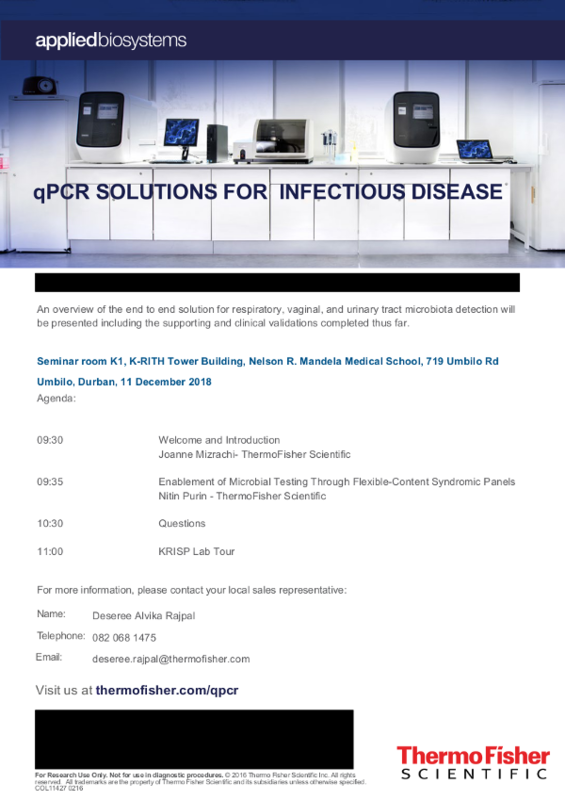 KRISP & Thermo Seminar and Lab Tour qPCR Solutions for Infectious Disease Seminar, 11 December 2018 (9:30 - 11:30), K-RITH building, Nelson R Mandela School of Medicine, UKZN, Durban, South Africa. All welcome! The development of commercially available, panel-based molecular pathogen detection tests has provided many benefits to laboratories. Some challenges still exist – including scalability in throughput, decreasing cost per sample, and increasing content flexibility to meet the ever-changing needs for detecting pathogenic targets. This talk will share learnings on how laboratories can drive down the cost of microbial testing with the utilization of nanofluidic and microfluidic solutions. We will share case-studies on how different solutions such as for pathogen detection for STIs, UTI and Respiratory track have been implemented. An overview of the end to end solution for respiratory, vaginal, and urinary tract microbiota detection will be presented including the supporting analytical and clinical validation done.